Ask and You Shall Receive - My Zipper Binder! Ask and You Shall Receive – My Zipper Binder! It looks like several of you have made a New Year’s Resolution to get those coupons organized, but you can’t find a great binder. Some of you have asked me where I found the one that I use. Well – I found it! 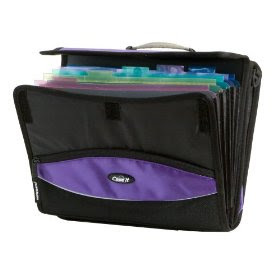 You can get the same Zipper Binder with Handle and Strap like I use for $18.75 shipped! This one is in purple, but there is also one in pink. Just scroll down a little and you will see Customers Who Viewed This Product Also Viewed. You can scroll through these. There are some other styles and colors. Just be sure to read through what the binder includes (or doesn’t). Some of them don’t have a carrying strap, but they do have a handle. Some don’t have outside stoarge. There are lots to choose from. Most of them will qualify for free shipping when you spend $25.00. However, if you click on the button that says Add to Cart with Free Two Day Shipping, you can get it shipped for free. Clicking this button will sign you up for a one month FREE trial of Amazon Prime. So, just get your binder delivered and then you can cancel the service at the end of your monthly trial.